School management software, school management system,online school automation software, online school automation system, school administration software, campus management software, campus automation system,website development india , B2B web portal design , Website Development odisha,Software Development bhubaneswar,school erp software in odhisa,india, odisha, bhubaneswar, cuttack, raurkela, berhampur, kolkata. 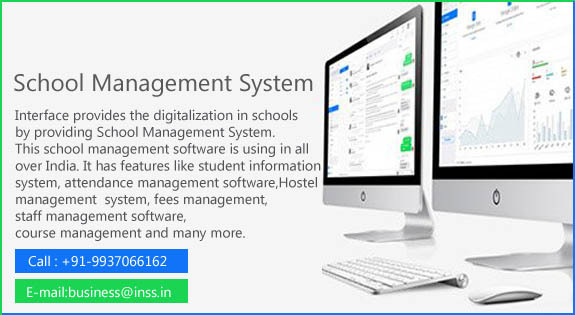 School ERP is a comprehensive web-based School Automation and Management Software which has been designed and tailored specially for educational institutes to assure smooth administration and management of various scholastic activities. It ensures better interaction between students, teachers, parents & school management committee. School Automation Software takes care of overall school administration and management, helping them to make effective managerial decisions leading to better management of resources available in the school. This School Automation Software contributes to manage their academic processes and administrations with greater flexibility. Being a web application; School ERP Software, School Automation Syestem aims at reducing the gap between information and the users and ensures that there is seamless flow of information. School Management Software can be accessed from anywhere on any computer at any time. It doesn’t require any fixed installation or infrastructural investment and technical experts. School Software Bhubaneswar, School Management Software Company Odisha , School Website Design,School Software Development,School software bhubaneswar,School Website Development Company,School Automation Software,School ERP Software Solution,School Automation Software odisha,Online School Website India,School ERP Management Software Bhubaneswar,School ERP Software Development,School Management Information Softwate ,Online School Automation System Odisha , School Website Designing Company in Bhubaneswar Odisha.